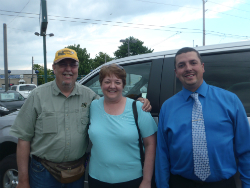 I just wanted to thank the staff at Davey Auto Sales for the wonderful experience in buying our new truck. Their staff helped us make a right decision without any pressure. I got to meet the owners and family and the rest of the staff. I got a real sense of family pride in this business. Once again, thank you for your kind service. I will be recommending Davey to my family and friends.